Australian guitarist Dom Turner (Backsliders) in tandem with Nikki Brown. 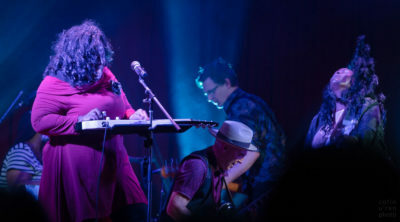 Hailing from Toledo, Ohio, Nikki Brown was born into a Church-based slide guitar tradition known as Sacred Steel and learnt from renowned steel guitar master, Del Grace. She has been described by Guitar World as the“Jimi Hendrix of Sacred Steel” and is an electric lap steel guitar phenomenon. Her powerful vocals and performance has developed over a lifetime of gospel singing, resulting in a powerfully rich, raspy soul-gospel vocal style delivered with impeccable flare and flamboyancy. Joining Dom and Nikki are her sister Gloria (rhythm guitar and vocals) and cousin Tomika (drums and vocals) who share the same deep musical heritage and love of infectious gospel-soul funk- blues music. Tickets all one price: $38 (includes all bkg fees and GST).